If you’re unclear about 99211, you’re not alone. A lot of debate surrounds the proper billing and documentation of E/M level service 99211 because aspects, like when to use it and when not to, can certainly be confusing. Since the adoption of E/M codes, requirements for reporting most levels have become incredibly specific, and following these mostly black-and-white rules leads to an increasingly small margin of error in level selection. 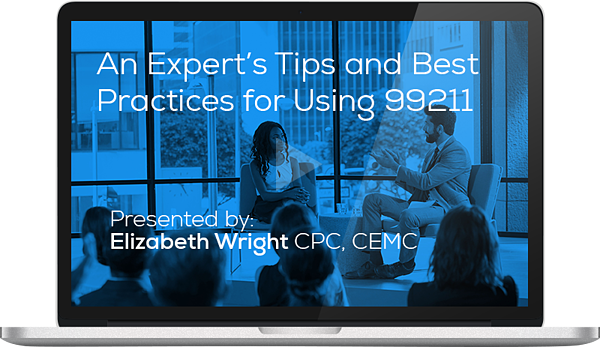 Unsurprisingly, 99211 is one of our hottest topics this year. That’s why we’re offering even more E/M level service 99211 info, in-detail where we can elaborate on acceptable use even further. Note: You will receive your CEU in a separate email after you have watched the webinar in its entirety.